At Memzy, we complete brain science research projects because evidence beats opinion. This is our mantra when we set to figure out how humans pay attention, remember, and decide to act. We are excited about cognitive and behavioral research, but equally thrilled to peak underneath the human skull and detect what happens beyond conscious self-appraisal and observing someone’s behavior. The examples below detail research projects and findings that we include in our brain science workshops, content design for clients, and keynote presentations. When audiences’ brains are exposed to your content, their neurons are abuzz with a lot of activity. When neurons communicate with each other, they produce brain waves, which oscillate at different frequencies, with rhythmic highs and lows. 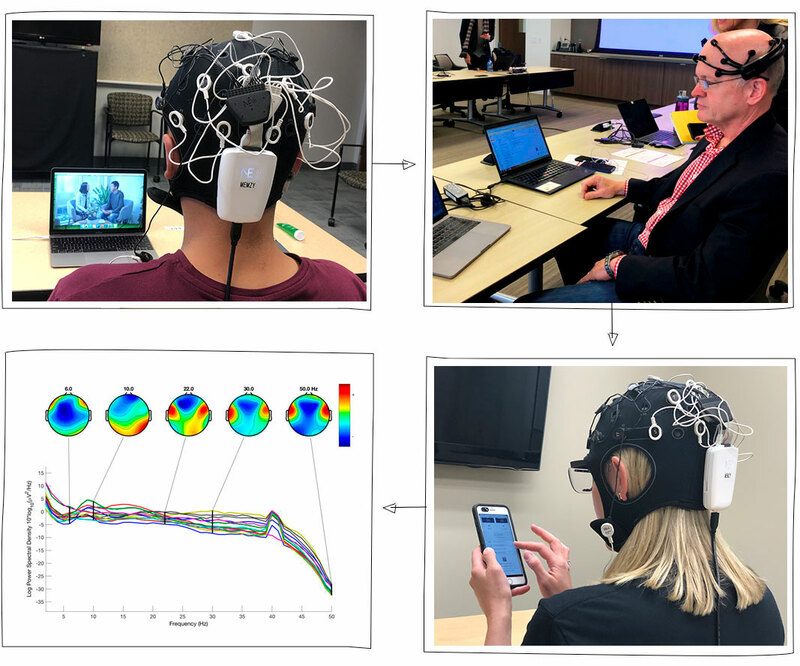 During our EEG (electroencephalogram) research, we place a set of electrodes on participants’ scalps and capture their brain waves as they are watching and listening to your content. We look for where specific waves occur, if there is coherence between these brain waves, and whether there is symmetry or asymmetry between waves in brain regions responsible for paying attention and forming memories. One of the main benefits of EEG data is its high temporal resolution, meaning that we can detect a reaction to a stimulus when it happens. We can then associate what we observed in the brain with what the stimulus contained and make inferences related to what attracts attention and what helps the brain form memories. Business content is often too neutral, meaning that in the absence of strong emotions, electrical signals generated in the brain are too weak to lead to the formation of a memory trace. In other words, most business content leaves us flat. Encoding and retrieval are different, meaning that presenters something at point A but it’s different than what audiences are likely to see later, at point B. The lesson is to link what you’re sharing at point A to something that is likely to trigger a memory at point B (e.g., an object or a system people are already using). We used to believe that people forgot about 90% of a presentation after 2 days. The number is more dire than that. Looking at the 9 studies I conducted, the recall rate is less than 1%. This means we have to adopt new habits of presenting if we want our audiences to remember more and to remember the right things.